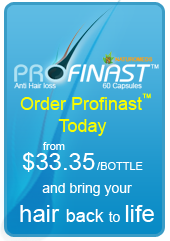 Discover why PROFINAST is a better choice…..
*If you have any serious health concern, please review all the ingredients with your doctor before adding PROFINAST in your regimen. Gelatin, Rice Flour, Magnesium Stearate, Silicon Dioxide, Maltodextrin, Water. Medically speaking, reasons behind alopecia can be genetic as well as hormonal. Androgenetic alopecia or “male-pattern hair loss” is implicated in more than 90% of hair loss cases. The main hormone byproduct responsible for male-pattern baldness is called DHT (Dihydrotestostrone). With gradual increase of DHT in body over a period of time, hair follicles start becoming thinner and finer until the hair is permanently lost. Vitamin B6 : Vitamin B6 promotes hair growth and prevents hair loss. Biotin : Vitamin B complex, essential for healthy skin, hair and nails. Magnesium, helps in chemical reactions in the body including energy metabolism, protein synthesis, neuromuscular transmission, bone structure and hair growth. Zinc helps in cell division, increasing hair density and reversing hair loss. Saw Palmetto extract, reduce DHT formation and blocks the DHT receptor sites. Muria Puama helps with stress management, nervous system stimulation, virility, and overall health.